I have a tendency to avoid extremely popular topics, such as Bigfoot or the Loch Ness Monster, because there’s so much information on them, it’s more or less impossible to try to address the issue thoroughly without writing a book. After a bit of thinking, however, there’s one guy who can be revealed as pure baloney in just a few pages: Nostradamus. 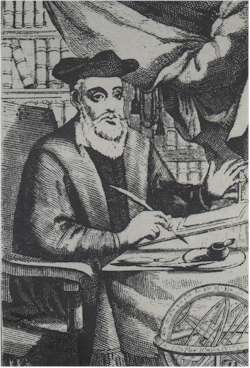 Nostradamus was born in 1503 in France with the rather suave-sounding name Michel de Nostradame. He lived a fairly normal life, obtaining a degree from university, and watching his wife and child die from the plague. Just to add insult to injury, it was shortly after their death that the Inquisition sent for him to be tried for heresy: some years before, he had mentioned that a particular religious statue was not very artistically pleasing. The statue-maker, naturally, denounced him to the church. So Nostradamus did what anyone would have done: he ran and hid. He managed to stay clear of the church for the rest of his life, and published almanacs and other books to get by until he married a rich widow. Now living comfortably, he converted the top floor of their house into a study, where he would stay until the early hours with his occult books, writing his predictions. He was so popular that even the queen of France became smitten with the sorcerer, and ate up everything he told her. Until, that is, the church came around and inquired about what Nostradamus was doing, at which time he once again fled. The poems are written in an obscure blend of medieval French, Latin, Greek, Italian, and a regional French dialect called Provencal. Occult enthusiasts the world over claim that they predict future events, ranging from the death of a French king in Nostradamus’ day to the terrorist attacks of September 11th. I’m sure everyone has heard of him; he’s nothing short of a household name. Hmm. That makes substantially less sense. Randi, with a better grasp of history than Cheetham, knew that ‘Hister’ is not an ancient name for ‘Hitler,’ rather, it is a geographical region near the lower Danube river. Of course, the occult enthusiast claims that since Hitler was born near the Danube, it still clearly refers to him. I’ve got to admit: they just don’t know when they’ve been beaten. That’s the problem with all of Nostradamus’ writings: it’s open to interpretation. They are written in such a vague style that they could be bent to take on any meaning. It’s like in ancient Greece, when young men would go to the oracle and ask whether or not they should join the army. The oracle would reply “You the Romans will conquer.” Is the young man going to ruin the Romans, or are they going to roll over him in an unstoppable wave of phalanxes? It’s all open to interpretation. You can find all this information on the internet. But here is where I distinguish myself from other authors: I claim that I am as powerful a prophet as the might Nostradamus. I have written ten quatrains, which I am giving the bold title of The Magnificent Deci-Centurie. I have forseen that, in the next month, all of the things described in them will come to pass. And I’m doing one over on Nostradamus: he wrote in an obscure mixture of languages that could be translated in any which way. I’m doing them in plain English. Additionally, I’ve taken a handful of four line lyrics from songs by the best band of all time, Devo. It just might be that they are better psychics than I. 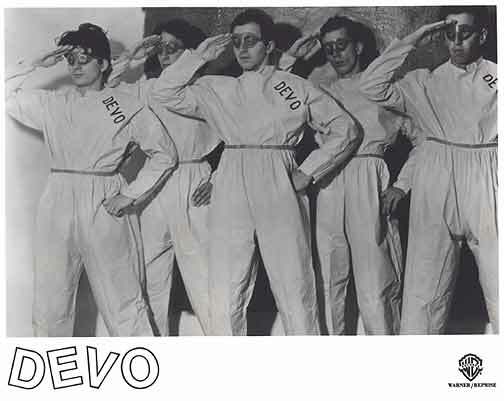 A month from now, expect an update, at which time I will most likely reveal myself and the fellows in Devo to be the world’s foremost mystics. These are imitation quatrains that I wrote on the 15th of April, 2006. Expect an update on the 15th of May as to whether or not they came true. I wrote them the same way that Nostradamus did: I just sort of sat around until they came to me. I avoided thinking of things that will likely happen in the near future and phrasing them vaguely: I just sat until funny phrases popped into my head. Below this can be found ten quatrains made from Devo lyrics. They will also be analyzed in one month's time to see if that group has been trying to send us coded messages about the future. The largest of the turkeys shall find madness. After a long time silence shall be found. Shall find itself lost in the smallest forest. Shall help him find his nuts. From the great desert, a fish emerges wearing a yellow crown. In the other, a bloody hammer. Beneath his tail grow wildflowers of harmony. The Briton readies his accent against the coming storm. From the highest place falls the longest moustache. Bound unto the loathsome creature. Is not a place for cooking soup. Landing with a splash near the Amazon. A slice of bacon shall be found. O, what sorrow! O, what horror! O, what wretched hope! Undercooked, the slice has spoiled in the sunlight. And pulls his face down over his eyes. A new king rules the bathroom. The foolish one showers ancient names in vulgarity. Many teeth will be broken on the soufflé of hopelessness.